I am stepping outside of my comfort zone today. Large roasts are so intimidating to me. Including the Thanksgiving turkey! I have made several roasts with success over the years, but they still make me nervous. I think it’s because it’s so easy to screw them up, and if you screw it up, there is no going back. No dinner will be served. You ruined the whole meal in one fell swoop. Scary stuff, especially for this chronic perfectionist over here. Last year, I bought a pre-brined/cooked turkey for Thanksgiving. I got mine from Whole Foods, thinking it would be an easy foolproof way to serve the 15+ people I had coming over (think of all the oven space it would free up!). All that had to be done was warm it up in the oven prior to serving. I screwed it up. I heated it up at too high of a temperature and the entire thing dried out like crazy. I was so upset! You know the scene from Christmas Vacation where they all have to eat the horribly dried turkey by dunking it in their water glasses and swishing it around in their mouths like mouthwash? It was kind of like that. OK, maybe not THAT bad, but it was definitely a let down. Needless to say, I am making my own turkey from scratch this year. Which I have done many times in the past, so I’m not sure exactly why I swayed away last year. Never again. My whole point in telling you all this is that if roasting large cuts of meat freaks you out, I SEE YOU. I’ve so been there. Many times. Today’s recipe, though, is pretty easy to pull off! And that’s coming from a roast-a-phobe. 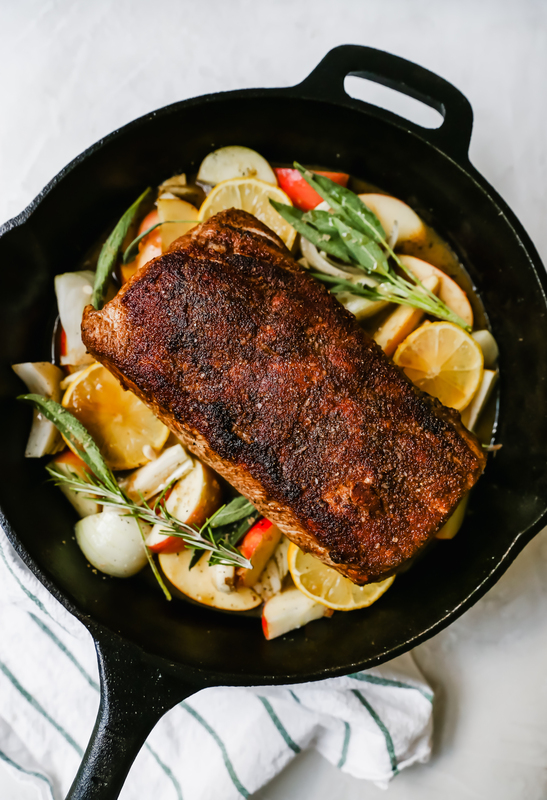 This chai-rubbed pork roast comes out super juicy and flavorful, and there are a few easy steps to ensure this happens every time. 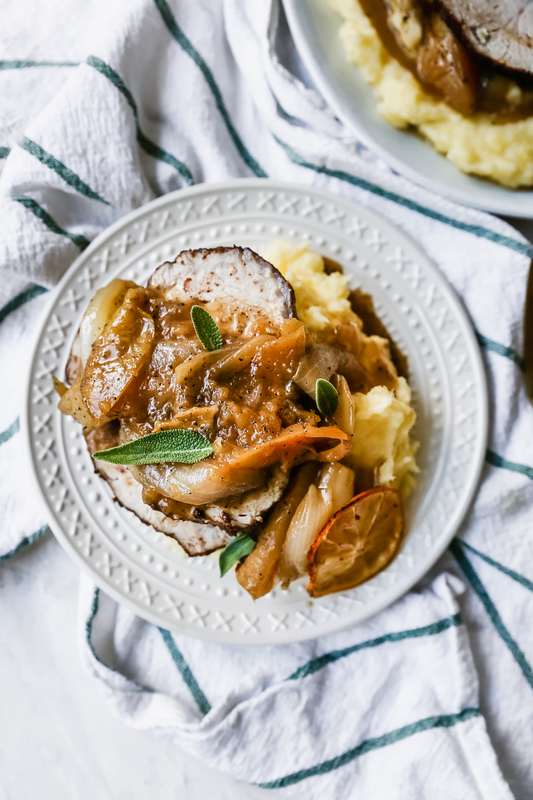 The results: an incredibly flavorful and moist (sorry) pork roast that gets slathered in all the fall flavors of chai and apple. Good stuff, people, good stuff. I used a lean boneless pork loin and seasoned the bajeezus out of it, with the thought that even if I screwed it up and it came out like a dried hockey puck, at least it would have good flavor. Hah. I made a savory chai spice rub (um, yum) and slathered it all over the outside of the pork. A quick sear in a smokin’ hot pan created a nice crust on the outside of the pork. I think this step is CRUCIAL, as it creates a sort of seal on the outside of the roast, which helps keep all the lucious juices on the inside! Plus, it adds an amazing amount of flavor to the pork. Don’t skip this step! 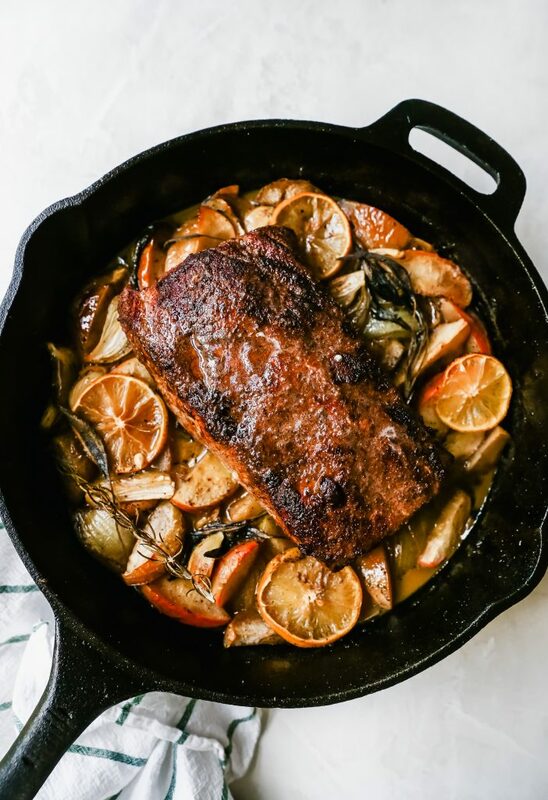 Once your meat is seared nicely on all sides, you deglaze the pan with some stock and apple cider, scraping up all the delicious browned bits on the bottom of the pan. Another crucial step! This adds so much dang flavor to your pan sauce. It’s imperative. Next, you throw in a bunch of sliced onions and apples, along with some garlic, herbs, and lemon slices. 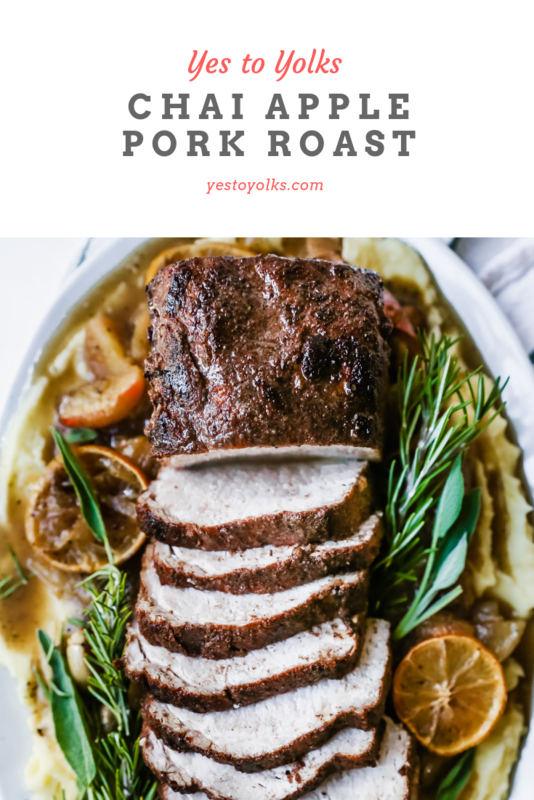 Return the pork roast to the pan and pop the whole thing in the oven. Next crucial step? CHECKING THE TEMPERATURE OF YOUR ROAST AS IT COOKS. I cannot stress this enough. A lot of recipes call for things to be cooked for set times, like 35 minutes or 1 hour. 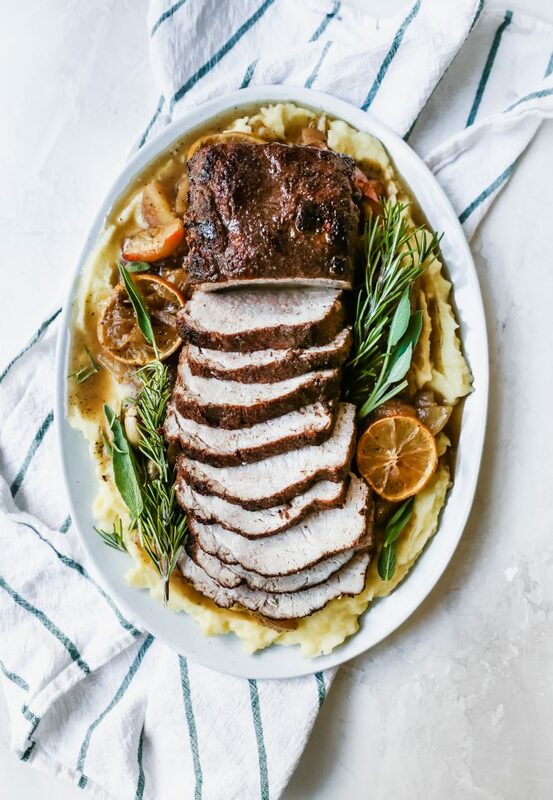 Every oven is different, and every roast is a different size, which means that it is not possible to give an exact “correct” cooking time for recipes like this. I used a 2.6-lb roast and cooked mine for 40 minutes. But! I started checking the internal temperature of the meat with a thermometer around 30 minutes, and then kept checking ever 3-5 minutes after that. Because, guess what, that temperature can change in MINUTES. You go from juicy, delicious meat to dried out hockey puck status in no time. This is probably the most important step of all, actually. Get yourself a good meat thermometer (they’re not expensive! I like this one) and be as paranoid as possible once that roast goes into the oven. As soon as the internal temperature hits 145°F, take it out of the oven ASAP and let it rest. It will continue to cook at room temperature. Letting the meat rest is another crucial step to success. Carving a freshly roasted piece of meat allows all the juices and flavor to leave the meat. Let it rest for a good 20 minutes before you even think of cutting into it! It makes all the difference in the world. 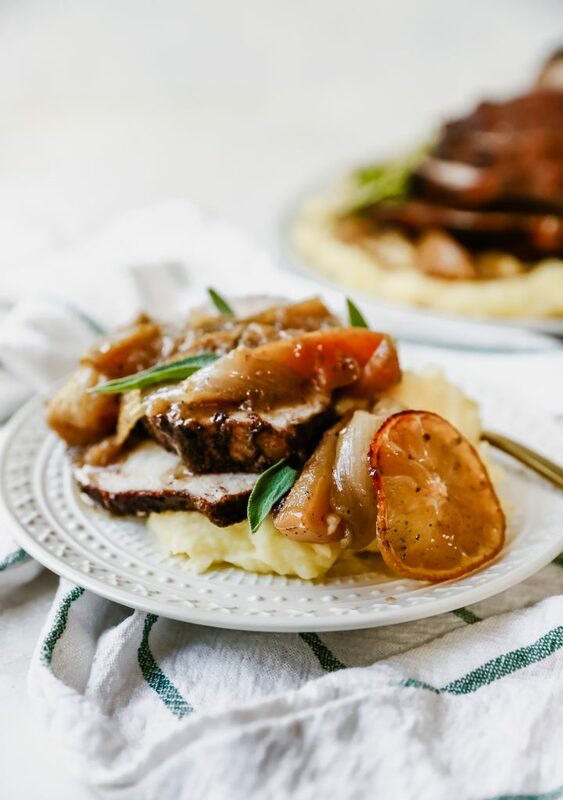 Once the meat has rested and can be sliced, you want to put it on a plate or platter and completely smother it in the INSANE pan juices and roasted apples/onions that it cooked in. OMG. I served this with simple mashed potatoes, and it was the best decision ever. You can, however, serve this alongside whatever you like. Rice, roasted veggies, or even cauliflower mash would all work. This dish came out even better than I was hoping. I’ve had this idea in my head since early spring, but wanted to wait until it was more seasonally appropriate. And let me just say, this is the most autumn-y dish ever. 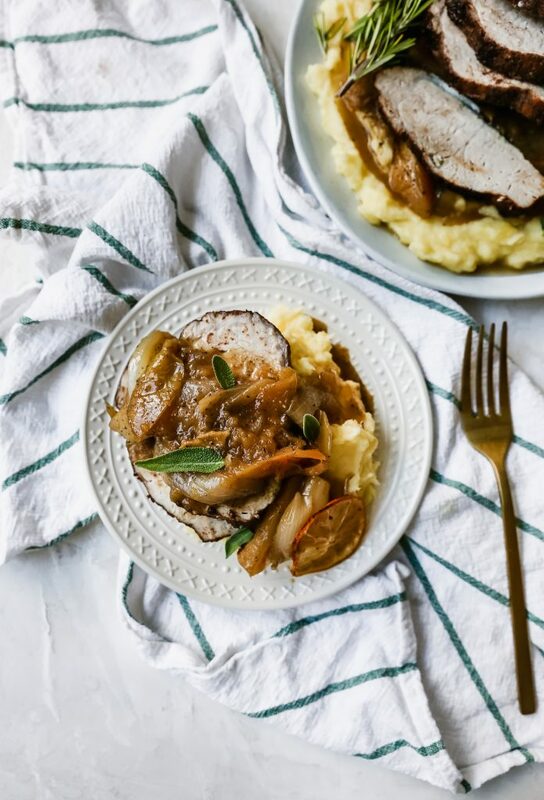 Chai spice, apples, apple cider, juicy pork, warm sage and rosemary. It has it all. In a small bowl, combine all the spices, salt, and pepper. Pat the roast dry with paper towels and then coat on all sides with the chai spice rub, pressing it into the meat and ensuring everything is evenly covered. Heat a large oven-safe skillet over high heat and add the oil. Once the oil is hot and shimmering, add the pork roast and brown on all sides, about 4 minutes per side. 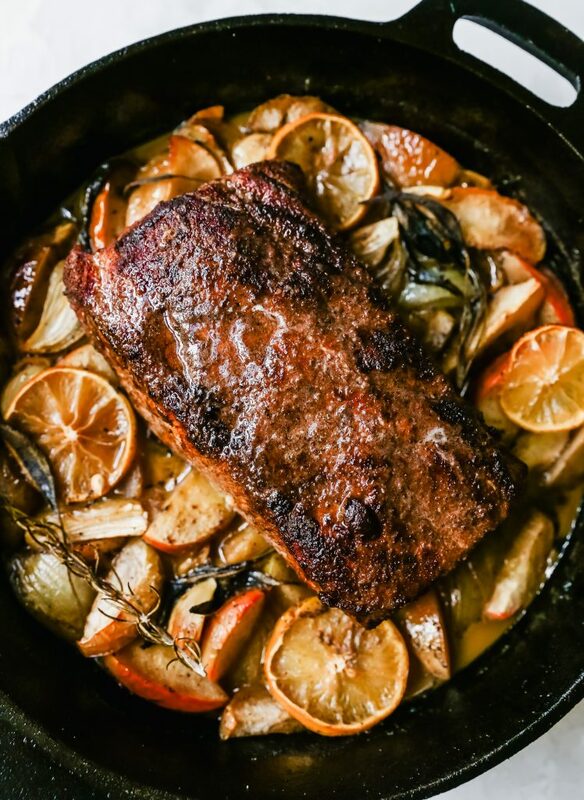 Remove the roast from the pan, set aside on a plate, and reduce the heat to medium-low. Add in the apple cider and chicken stock, scraping up any brown bits on the bottom of the pan. Cook until the liquids are reduced by half. Add in the apples, onions, garlic cloves, rosemary, and sage. Season everything in the pan with a pinch of salt and pepper. Slice a few rounds from the lemon and add them to the pan. Squeeze the remaining lemon juice over everything in pan. Sprinkle the brown sugar evenly over top and gently stir to combine everything. Return the pork roast to the pan, nestling it into the apple and onion mixture. 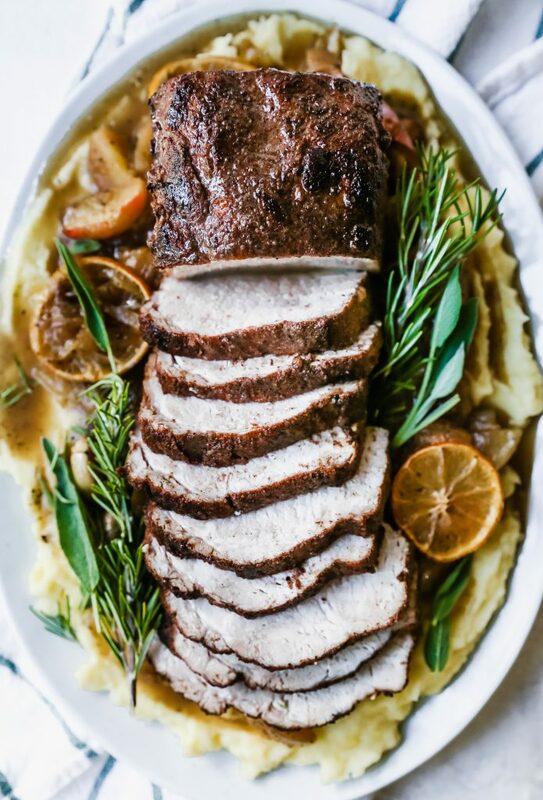 Roast the pork for 40-50 minutes, or until a meat thermometer registers 145°F in the thickest part of the roast. I highly recommend you start testing your roast around 30 minutes, as every oven and roast is different. Keep checking every few minutes until it comes up to the correct temperature. 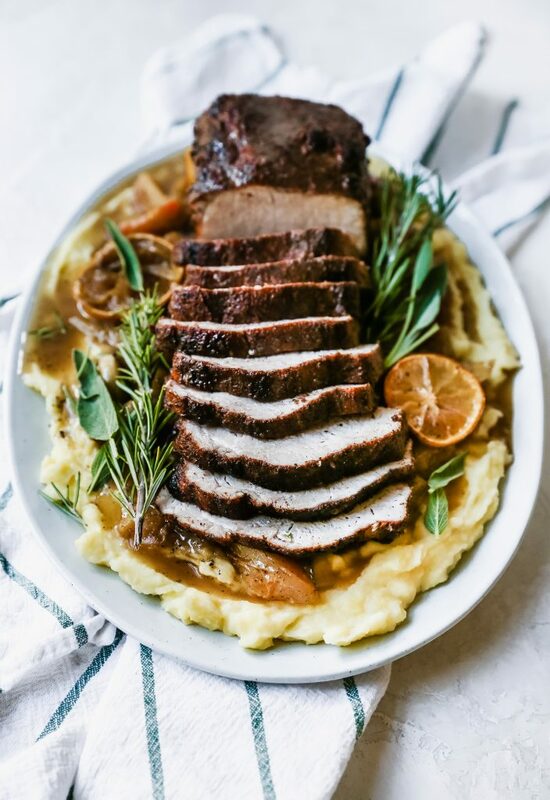 Remove the pork roast from the pan, tent with tin foil, and allow to rest on a cutting board for at least 20 minutes before you slice it. Spoon the apple and onion mixture onto a large serving platter or individual serving plates. 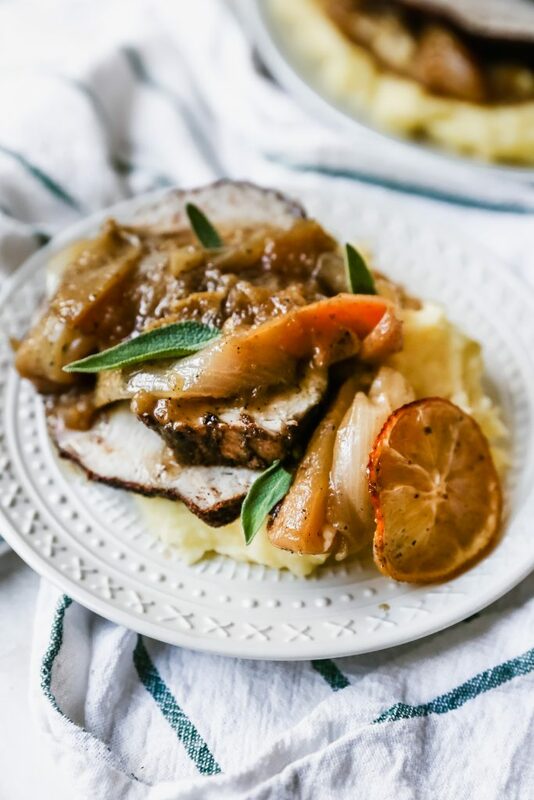 Thinly slice the pork roast and place on top of the apple and onion mixture. Drizzle over any accumulated pan juices and serve warm, alongside mashed potatoes or any other side dish you prefer.